Pete Wentzell was 10 years old. He lived in Biloxi, in a one-story ranch home directly across Highway 90 from the beautiful Gulf of Mexico. His memories are of an idyllic childhood on the Mississippi Gulf Coast, until August 17, 1969. He remembers the sugar cane that grew right outside their kitchen window. The beach was taken for granted. Summer meant beat-up tennis shoes and cutoff shorts, crabbing in the warm Gulf waters at low tide with a kerosene lantern and a gig for any unsuspecting flounder he might find. He could bicycle anyplace he wanted. He had a secret hiding place in a grove of sugar cane. Pete remembers waking up at 3 a.m. on Sunday, August 17, 1969. Something was eerily wrong in those early pre-dawn hours. He didn’t know what it was, but it terrified him. He could smell coffee. His dad was in the living room in front of the family’s Curtis Mathes console stereo listening to the radio, plotting latitude and longitude coordinates on a hurricane tracking chart. The windows had been boarded up during while Pete slept. 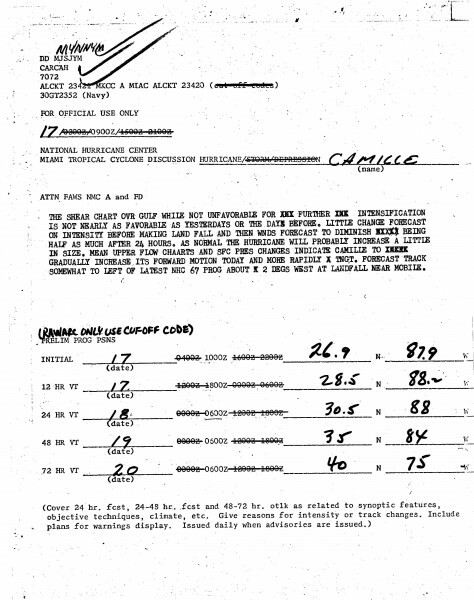 His father had been a military weather forecaster during World War II in Europe. 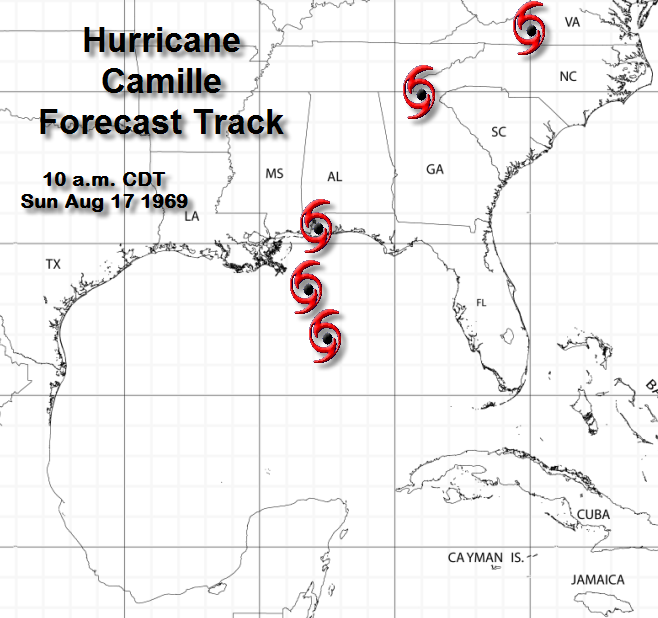 The newscaster’s tone was serious as he reported that the National Hurricane Center Director Robert Simpson was saying that Camille was going to be an unprecedented storm. Pete’s father told the youngster that the family was going to evacuate their home. Evacuate! That had never happened before. There had been other hurricanes, like 1965’s Hurricane Betsy. Pete was told to pack clothes in a suitcase. Clothes for summer, fall, and winter. Being an avid fan of toy cars, Pete chose to use his luggage space for his prized Matchbox City. Of course, he failed inspection later, and the toys were replaced with the clothes. He was not worried. They would be back tomorrow. Everything would be okay. 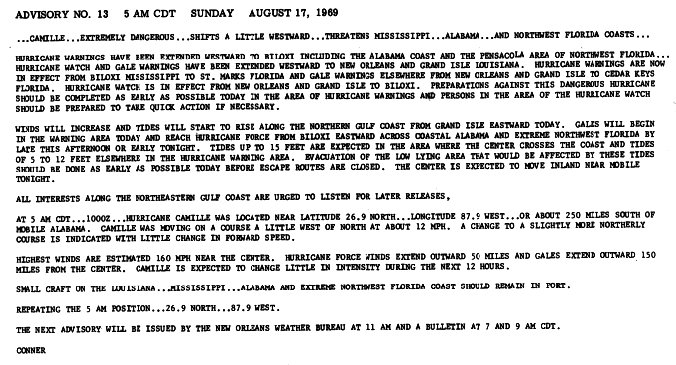 Pete’s dad was like many grownups along the Mississippi coast early on that Sunday morning, August 17, 1969. They had their tracking charts, some of them magnetic, some paper. This hurricane was not turning northward toward Northwest Florida…it was still moving northwest. 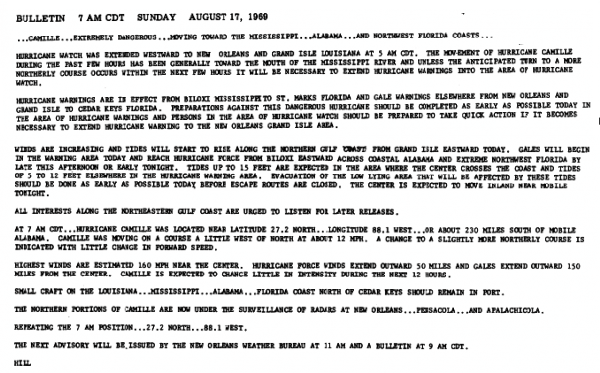 As it became more evident that Camille was not going to make the anticipated northerly turn on Sunday morning, August 17, 1969, forecasters hastily extended warnings westward to New Orleans and Grand Isle. Emergency preparations were underway on the Mississippi coast where residents were waking to the shocking news that one of the strongest hurricanes in history was headed their way.